Microsoft support for all versions of Windows Server 2003 and Windows Server 2003 R2 ends on July 14, 2015. After this date, updates will no longer be available, and your business will become exposed to compliance and security risks. Anticipating wide-scale changes before the impending deadline, Cisco and Microsoft have teamed up to provide the best single-platform solution on the market. 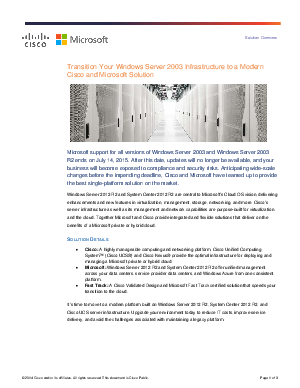 Read this paper to find out how the Cisco and Microsoft data center solutions provide your IT infrastructure with the flexibility and agility needed to address your changing business needs and achieve your business goals—while decreasing the TCO of maintaining a physical, on-premises data center.